LANSING — One of the candidates for a university board position last year reported raising more money than the 11 other major party nominees combined, according to campaign finance disclosures. While less than 2-percentage points decided races for spots on state university boards in 2016, the candidates’ fundraising totals and where their money came from had much larger differences. 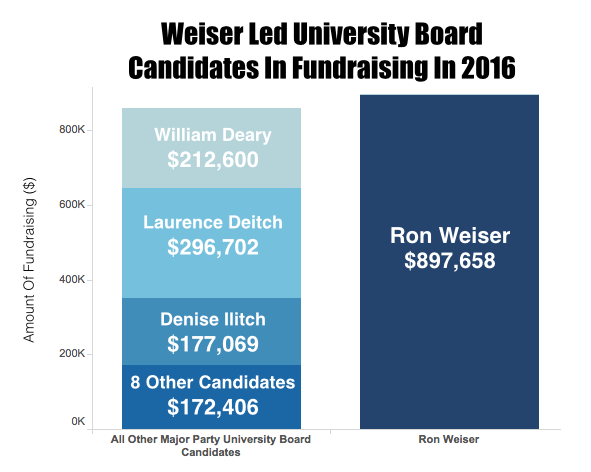 The top fundraiser was businessman Ron Weiser, a former Michigan Republican Party chairman who was re-elected to that job earlier this month. Weiser reported $897,658 in total contributions for his 2016 campaign for the University of Michigan Board of Regents. The 11 other major party candidates for positions on the University of Michigan Board of Regents, the Michigan State University Board of Trustees and the Wayne State University Board of Governors reported raising a combined total of $858,777. Members of the university boards serve without compensation. These down-ballot races tend to go to the party that does the best at the top of the ticket. But because the race for president was so close in Michigan in 2016, both major parties won university board seats in November. 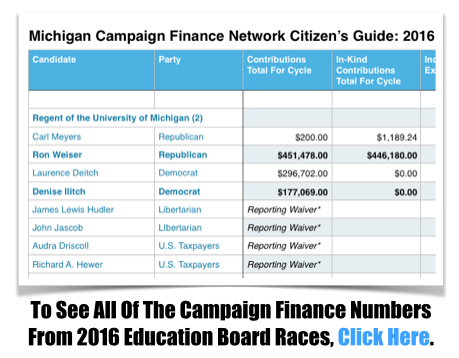 Below is a run-down of the campaign finance numbers for 2016 major party candidates for university board positions and for the State Board of Education. Weiser, a Republican Party donor, was one of four major party candidates running for two positions on the University of Michigan board. He narrowly won one, coming in second place overall. He beat third-place finisher, Carl Meyers, also a Republican, by 0.81 percent. Weiser scored 23.47 percent of the vote while Meyers got 22.66 percent. Meyers reported raising just $1,389 for his campaign. The wide majority of Weiser’s campaign cash came from his own pockets. According to campaign finance reports, Weiser gave $608,280 of his own money to his campaign. Some of the giving came in the form of in-kind contributions. Weiser ran unsuccessfully for the board in 2014, when he contributed $1 million to his own campaign. In 2016, Weiser’s campaign also received money from some major players in Republican politics, including members of West Michigan’s DeVos family, who combined to give Weiser $36,000. Linda McMahon, former chief executive for World Wrestling Entertainment and currently administrator of the Small Business Administration, chipped in $6,800 for Weiser’s campaign. Weiser spent heavily on phone and digital advertising and about $280,000 on various radio advertisements across the state. She provided $60,185 of her own money for her campaign. She received $10,000 from the United Auto Workers (UAW) Voluntary PAC and $5,000 from the Michigan Education Association (MEA) PAC. Ilitch spent about $92,000 on a media campaign through Mundy Katowitz Media Inc.
Laurence Deitch, the other Democratic nominee, finished in fourth place with 21.6 percent of the vote. He raised $296,702. He received $10,000 contributions from the UAW PAC and from the Schostak Family PAC. Fewer dollars flowed to the race for two positions on the MSU Board of Trustees. The winners were Dan Kelly, a Republican who raised $47,650, and Dianne Byrum, a Democrat who raised $22,500. Kelly got 24.1 percent of the vote. Byrum got 23.9 percent. Byrum received $10,000 from the UAW PAC. Kelly received $1,600 in donations from various attorneys at the law firm Giarmarco, Mullins and Horton, P.C., where he serves on the board of directors. He also gave $40,000 to his own campaign. Diann Woodard, a Democrat, finished in third place, with 22.6 percent of the vote. She reported raising just $11,000. William Deary, a Republican, finished in fourth place with 22.3 percent of the vote. He actually reported raising the most of the four candidates at $212,600. Nearly all of it, $212,500, came from his own pockets, according to campaign finance reports. Gaffney reported $50,034 in contributions and received 23.1 percent of the vote. His top contributors included the UAW PAC, which gave $10,000, and the MEA PAC, which gave $5,000. Gaffney received $2,000 from Gary Torgow, a Detroit businessman. The Bernstein Family PAC and the Michigan Regional Council of Carpenters PAC each gave Gaffney donations of $2,500. Republican Michael Busuito won the second position available on the board with 23.09 percent of the vote. Busuito reported raising just $8,300 — all of it coming from himself. Democrat Yvette Anderson finished in third place with 23.0 percent of the vote. She reported raising $24,341. Republican Kim Shmina finished in fourth place with 22.7 percent of the vote. She reported raising just $6,951. The two winning candidates for spots on the State Board of Education raised the least money, according to disclosures. Republican Tom McMillin reported raising $12,389 while fellow Republican Nikki Snyder raised $6,682. McMillin got 23.2 percent and Snyder got 22.79 percent. McMillin received $1,000 donations from former Michigan Secretary of State Terri Land and Weiser. The two Democrats raised much more money but narrowly lost. Democrat John Austin, an incumbent, was the top fundraiser bringing in $155,218. He received 22.71 percent of the vote. Austin, who had a broad base of donors, received $10,000 from the UAW PAC, $5,000 from the MEA PAC and $2,000 from the Michigan Regional Council of Carpenters PAC. The other Democrat in the race was fourth-place finisher Ismael Ahmed, who received 20.1 percent of the vote. He reported raising $87,589 for his campaign. These State Board of Education positions are also unpaid, but members receive travel reimbursements.